Diethylethanolamine (100-37-8) is Colourless liquid. 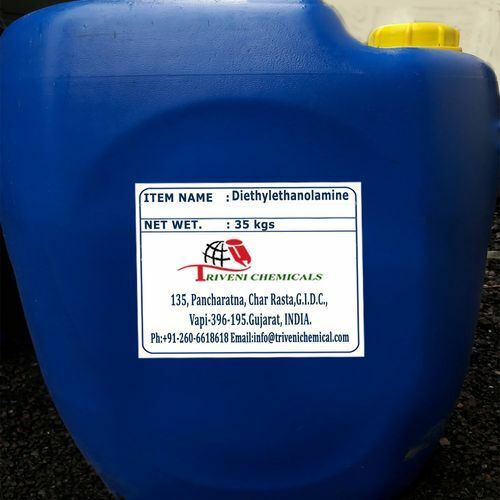 it is also known as 2-diethylaminoethanol, Diethylaminoethanol, N, N-Diethylethanolamine, N, N-Diethyl-2-aminoethanol and N-2-Diethylaminoethanol. Storage: Keep container tightly closed. Keep container in a cool, well-ventilated area. Diethylethanolamine (100-37-8) is Colourless liquid. it is also known as 2-diethylaminoethanol, Diethylaminoethanol, N,N-Diethylethanolamine, N,N-Diethyl-2-aminoethanol and N-2-Diethylaminoethanol. Storage: Keep container tightly closed. Keep container in a cool, well-ventilated area.